Both sides in the ballot fight over the charter cap are out knocking on doors in the run-up to Election Day. The public faces of each campaign are students, parents and teachers, pleading for fairness and excellence in every child’s education. Behind the scenes, though, an unprecedented clash of titans is taking place. 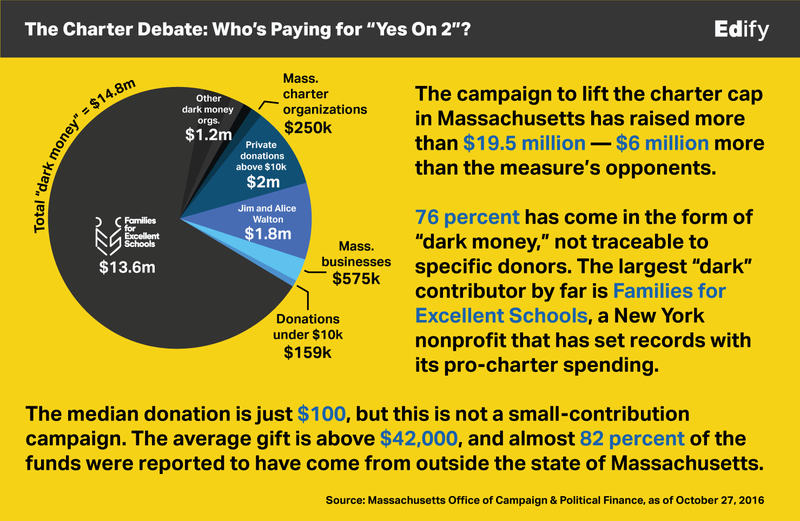 Supporters of Question 2 — the ballot measure that would raise the cap on the number of charter schools allowed to operate in Massachusetts — have contributed $19.5 million to the campaign; opponents have kicked in $13.4 million, according to filing data kept by the state Office of Campaign & Political Finance. Together that makes almost $33 million — more than twice the $15 million spent, mostly by gaming interests, in the 2014 casino debate, which had been the state’s most expensive campaign on a ballot question. And very little of that money comes from small, Bernie Sanders-sized donations. Though hundreds of people have contributed modest amounts of money this past year, the average contribution on both sides is about $40,000. 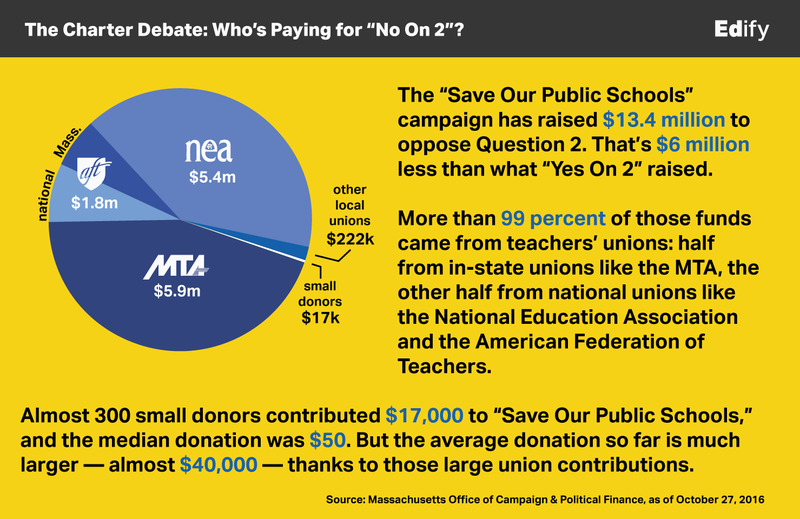 The opposition to Question 2 — organized under the name “Save Our Public Schools” — is almost entirely funded by national and local teachers’ unions; less than 1 percent came from other sources. The Massachusetts Teachers Association, the largest state union, contributed $5.9 million, surpassing the $5.4 million given by the National Education Association, the nation’s largest union with 2.9 million members. 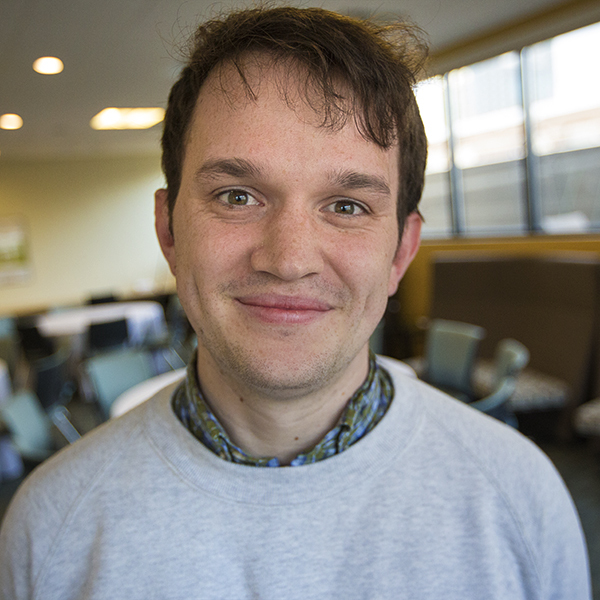 Smaller locals, led by the Boston Teachers Union, contributed around $300,000. 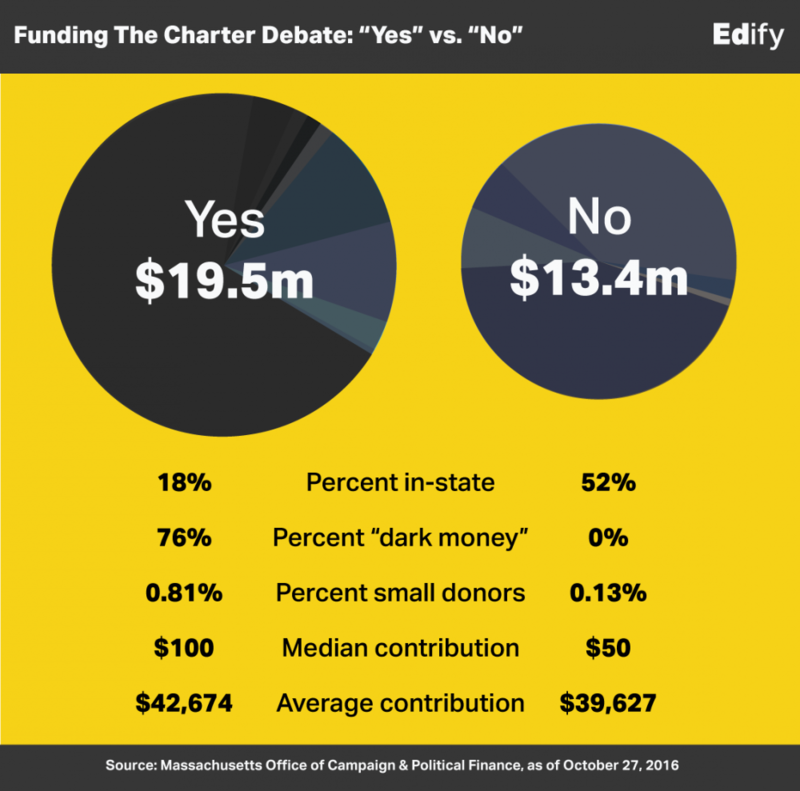 In total, about 56 percent of the “No” funding comes from sources inside Massachusetts. On both sides, the money mostly bought a relentless wave of TV advertising and outreach. Save Our Public Schools has spent almost $9.2 million on "media placement" with advertising firms as well as with Hulu and Facebook. Meanwhile, groups in support of Question 2 have spent $13.2 million on media buys with a single Alexandria, Virginia, ad agency — as well as $627,000 on canvassing. If the “No” contributions are mostly from teachers’ groups, they’re at least transparent. The base of “Yes on 2” supporters is more varied — and more unknown. According to OCPF data, almost 82 percent of contributions in support of Question 2 come from out-of-state, but it’s hard to say exactly where they originate. That’s because almost $15 million of the campaign’s total receipts consist of “dark money,” contributions from intermediary nonprofits that aren’t required to identify their donors. Foremost among those is Families for Excellent Schools, a controversial New York group whose donation total has surpassed $13.5 million so far — and keeps rising. But other out-of-state cash comes from familiar names in support of charters, including $1.8 million from Walmart heirs Jim and Alice Walton, $240,000 from former New York mayor Michael Bloomberg and $250,000 from John D. Arnold, a Texas-based billionaire and philanthropist. When asked why they contributed such a large sum to a statewide campaign happening more than a thousand miles away, John Arnold and his wife, Laura, replied through a spokeswoman. There’s a similar dynamic at work here at home. Private citizens in seven of the wealthiest suburbs of Boston — including Lexington, Newton, Wellesley and Concord — have contributed almost $326,000 to the ballot fight, nearly all of it in support of Question 2. And yet their school systems, combined, sent just 14 students to charter schools in the past year. So goes one of the most intriguing narratives about the past year's campaign: Most of the spending — and therefore much of the political speech — for and against the charter measure comes from people whose children almost certainly will not, or could not, ever attend the schools in question. That’s a reminder that charter schools remain the most divisive symbol in the ongoing national fight over education reform, being conducted high above the heads of the students supposed to be at the center of it all. 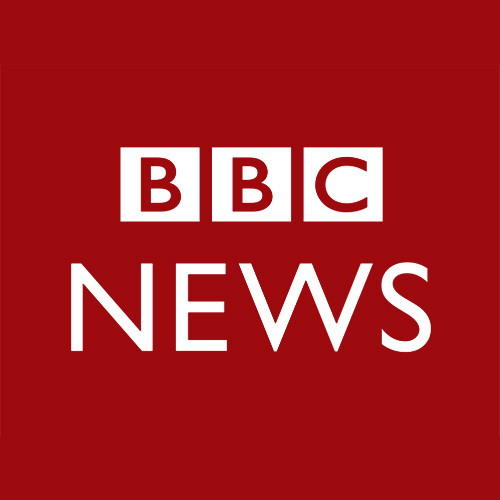 Who's Funding The Groups For And Against Ballot Question 2? A Look At The Money For And Against Legalized Marijuana In Mass.